Luang Por Tae's hometown was in Moo (village) 4, Bahn (House) Sahm Ngahm Noi, Ampher (District) Don Thom, Jangwat (Province) Nakon Pabtom. He was borned on 15th September BE2434. There were many famous monks who was born in that year, BE2434. During that time, if monks were being addressed as Luang Phor or Luang Poo, they were really very good monks because the villagers paid high respects to them, thus addressed them as Luang Phor and Luang Poo which means Grand Monks and Great Grand Monks. Unlike now, the address as Luang Phor and Luang Poo, do not have much significants, because these titles are usually given by the Government Officials. When Luang Por Tae was still a baby, his uncle Daeng, who was a monk brought and raised Luang Por Tae in the temple. Therefore, Luang Por Te spent his whole life in the temple; since he was a baby until the time he passed away. In fact, Luang Por Tae seldom lived in the temple, he spent most of his time in the forest as a Tudong. 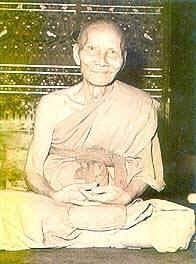 He was sincere in practising the Dhamma, thus Luang Por Tae was able to learn the Dhamma very well. The villagers had accidently seen Luang Por Te produced some miracle (power), and firmly believed that Luang Phor Tae had attained Arahang level. His uncle Daeng, brought him to Wat Gahlong, Jangwat Samutsahkon until he was 7 years old. Luang Por Tae returned and lived with his parents for 3 years. After that, his uncle Daeng brought him back to the temple again until the age 15 years old. Luang Por Tae was ordained a Naen (novice monk) under his uncle Daeng in BE2449. He lived in the forest temple where his uncle was the abbot. Luang PorTae ordained as a monk at the age of 20 years old. Luang Por Tah Wat Panaengtak was the preceptor and became Luang Phor Tae's teacher, after which Luang Por Tae followed Luang Por Tah to Wat Panaengtak. Luang Tae became the close disciple of Luang Por Tah. Luang Por Tah taught Luang Por Tae everything he knew about Dhamma and Sammahdti. Luang Por Tah would bring Luang Por Tae with him whenever he went Tudung, until such time at Luang Por Tae had gained enough experience to go Tudung alone. After Luang Por Tah has passed away, Luang Por Tae went to learn from Luang Por Chiam, Wat TaGong. Same as Luang Por Tah, Luang Por Chiam unselfishly taught Luang Por Tae everything he knew about Dhamma, Sammahdti, Tudung and Wichah. Once, Luang Por Chiam told Luang Por Tae that: "If you want to become Jow Koon (monk with a high title), take a train to Grungtep (Bangkok). If you want to become a real monk, you must enter the forest." Luang Por Tae choose the latter, and went into the forest and became a Tudung monk. It is said that Luang Por Tae was a monk who possessed alot of metta(loving-kindness) and bahramee(power). Whenever Luang Por Tae went for Tudung, many villagers would give money and things to him, but Luang Por Tae never accepted them, except the morning alms only. The villagers were not happy because they wanted Luang Por Tae to accept the money so that he could use the money to make merits for them. Luang Por Tae accepted some of the money and carried with him because he did not know where to keep them. One day, a robber wanted to rob Luang Por Tae of the money, but Luang Por Tae did not stop him, however Luang Por Tae told the robber that the money was not his, but belonged to the villagers who wished to make merits. If he took the money, the villagers would be disappointed because the money was meant for merit making. After the robber has listened to Luang Por Tae's, the robber felt very ashamed and ran off. Besides being a disciple of Luang Por Tah and Luang Por Chiam, Luang Por Tae had ever learnt Wichah from an Ah Jahn from Cambodia. The Wichah that Luang Por Tae used for making the famous Gumahn Torng was learnt from the Cambodia Ah Jahn. Luang Por Tae passed away in BE2524 at age of 90 years old.